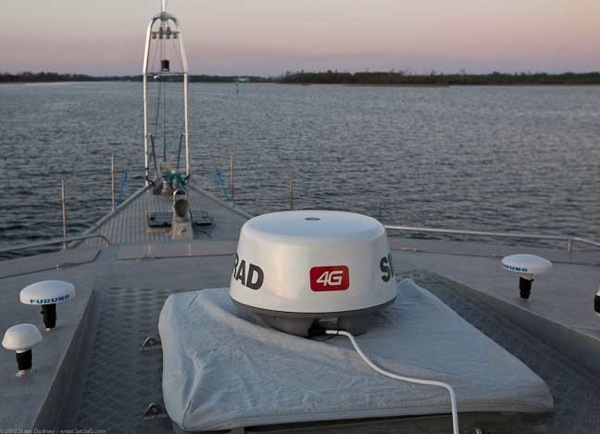 We’ve been hearing a lot about the Simrad 4G broadband radar, so when Cory McMahon of Triton Marine mentioned he could arrange a test aboard Wind Horse, we jumped at the chance. That’s the radome sitting on a 90cm/36″ hatch just forward of the flying bridge. Power draw is miniscule, the radome, as you can see, is tiny, and frankly, we found it hard to believe the claims of the 4G BB capabilities. What follows is a very brief test, but one that will give you a feel for what may be possible. 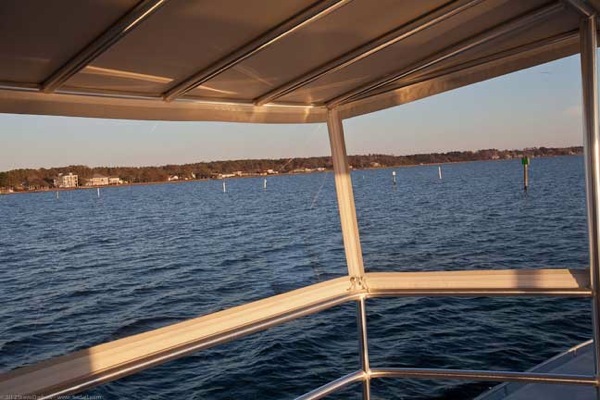 Looking out to port you will see a line of round poles marking the channel to a private marina off the Intracoastal Waterway. The main channel marker has a square number panel on top, but the round poles have nothing, so they are not the best target for a good return. Here is the radar display, set to 1/8th mile. Considering the radar antenna size, impressive. Having passed the channel, we turned around and took a look at it from a little further away. The channel markers are now merged together, but that is not unexpected with the beam width from the small antenna. Note that this antenna unit has a street price of around US$2000. A comparison of the same target with our Furuno 2117 radar with its 1.8m/6ft open array. Obviously a much better picture. But this system costs seven times that of the Simrad, not to mention the weight, power, and windage differential. Finally, here is a split0-screen view with the 4G BB. The left screen is looking 4 miles towards the ocean, at a bridge over the ICW. The right screen is the dock to which we’re about to tie. A few notes: first, we do not know how the 4G BB will perform in sea clutter and rain. There are claims that the broadband radar will excel in this regard. We’ll have to see that with a further test. 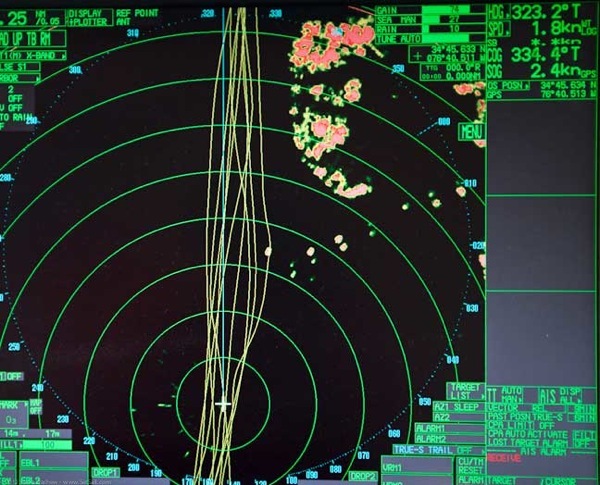 As a backup, and for watch keeping at anchor, this Simrad radar would be ideal. 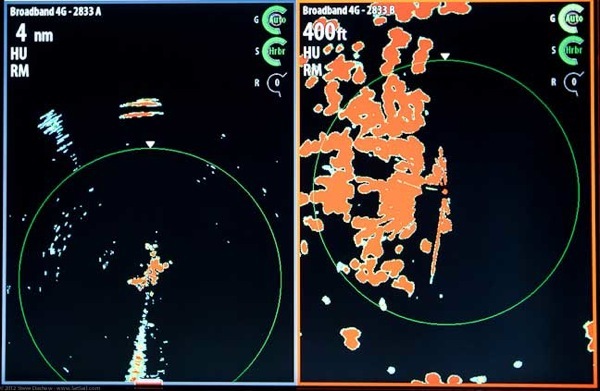 The Simrad engineers were circumspect about interference from the powerful Furuno 2117 getting onto the 4GBB if they were mounted too close, and both were in use at the same time. However, we found no interference with the 4G BB held directly under the Furuno 2117. Last fall, when we did this test, you could use the 4G BB with Nick White’s Expedition software, with the purchase of a license from Simrad. The folks at Coastal Explorer told us they were working on offering something similar, but there were come cost issues with the licensing that need to be resolved. 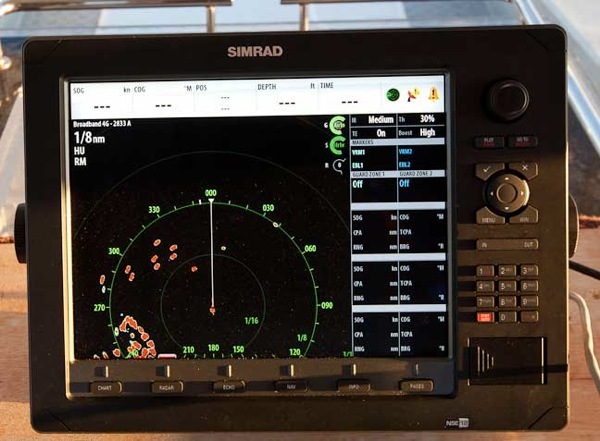 So, you might need to consider the Simrad display as a part of the system (the display is very clear in direct sunlight, and the software easy to use). Bottom line: based on what we have seen so far this is an impressive piece of gear, possibly a breakthrough product for sailboats where weight, windage, and power consumption limit your options. The key will be how the 4G BB stacks up against conventional radars with larger antennae in sea clutter and rain. This entry was posted on Sunday, April 15th, 2012 at 11:39 am and is filed under Dashew Logs. Both comments and pings are currently closed. 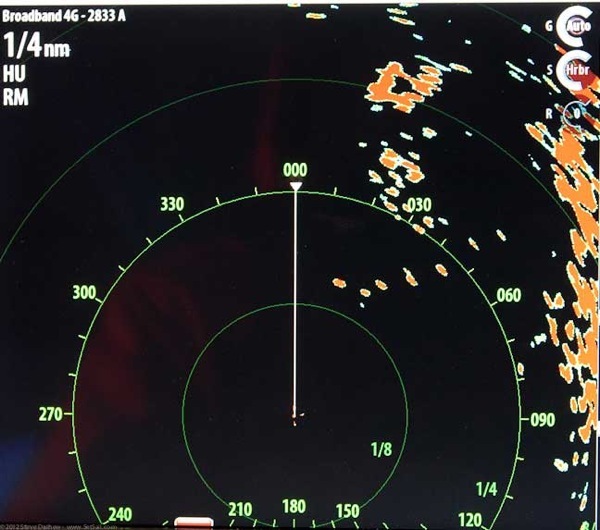 I am having an issue with my Simrad 4G radar and I see that one of your pictures shows my exact problem, but you don’t mention it. In the screenshot with the dual ranges, 400ft and 400nm, in the left panel, it shows the noise I am getting. This noise is a big problem in that it sets off the guard zone alarm. We had no problem during our passage from Los Angeles to French Polynesia but now it’s getting very bad and makes the guard zone alarm unusable. I just thought you might like to know. how the “rain testing” went. which usually also mean strong winds, thus giving us time to reduce sail. No experience in rain with the Simrad BB rain. How it would do picking out targets in rain compared to a conventional set have no idea. But it looks like it would have no trouble seeing rain squalls. We’ve used the Simrad 4G on a 7000 mile Pacific crossing and it detects rain and squalls very well. We are still having an issue with spurious noise though. Simrad replaced our first raydome and now the new one is showing noise with mechanical vibration such as sails luffing or waves hitting the boat. This “noise” doesn’t obscure targets but it does render the guard zone feature mostly unusable.